Coaching is a way to help people reach their potential, get energy to pursue towards important goals and understand their life or work from a new perspective. The best coaches I’ve met, they only use questions to open up and clarify my thinking. I struggle with this issue: I am not the best coach, I’ve only started my journey to become a great coach. And who says coaching (only asking questions) is the only way to help other people? Could I find something that fits my personal style, allows me to be not-perfect and suits in different situations? I got the following model from Kati Vilkki at Nokia Siemens Networks some years ago. It has proven to be very useful for me, when I have been moving from (command-and-control) management role to a coaching role. The model helps me to understand my behavior. I never impose this to people I talk with: I do not judge or evaluate people with this — I don’t even show them this model. This is a tool for me to plan a discussion or reflect the discussion I just had. 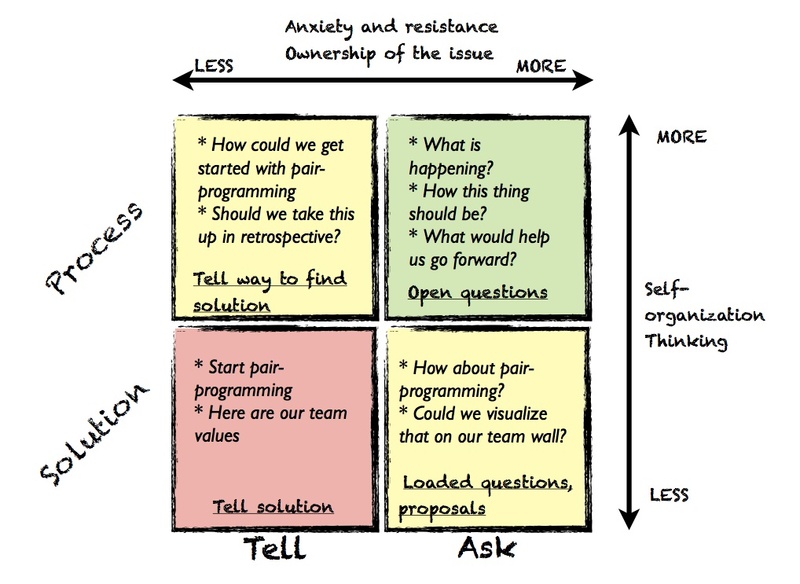 The model looks at discussion topics from two angles: (1) Do I focus on the process or solution and (2) how supportive or directive my approach is. There are couple of points worth mentioning with the model. Different situations require different approach. Different approach gives different long-term outcome. Using lefthand and bottom corners increases dependency. Providing answers (process or solution) does not encourage people to that by themselves. People and teams will not develop to be self-organized. Ownership of the issue stays on advice-giver — therefore advices that you give may not stick and the the team falls back to old ways of working. On the other hand, working on the righthand side and top may feel uncomfortable and increase anxiety. Imagine if a person comes to you asking for help (assuming you give advice) and suddenly you start asking questions? The person may feel ignored or even angry. I have found out that whichever “box” you start the discussion, you can only move left or down. If you start advising or telling the process, the others will expect you to continue on the same lines. It will be very hard to “climb up”. That is helpful point for me: In every discussion I try to start as “high” as possible. A corollary to the previous point is that you can move down or left. I use this if the situation is not suitable for top-right corner. Maybe people are exhausted and need more support. Maybe people feel there is not time for open questions and I help them find more time. Maybe the meeting invitation mentioned “a professional who will answer all your questions“. Whatever the reason is, I can move “down” in the model and provide more safety when needed. As I mentioned earlier, this is a tool for self-reflection and developing as a coach. This model does not give you ready-made questions or structure to design discussions. I use this model simply to understand my style and how it may affect the people I am talking with. By the way, which category in the model this blog itself post would fit in?